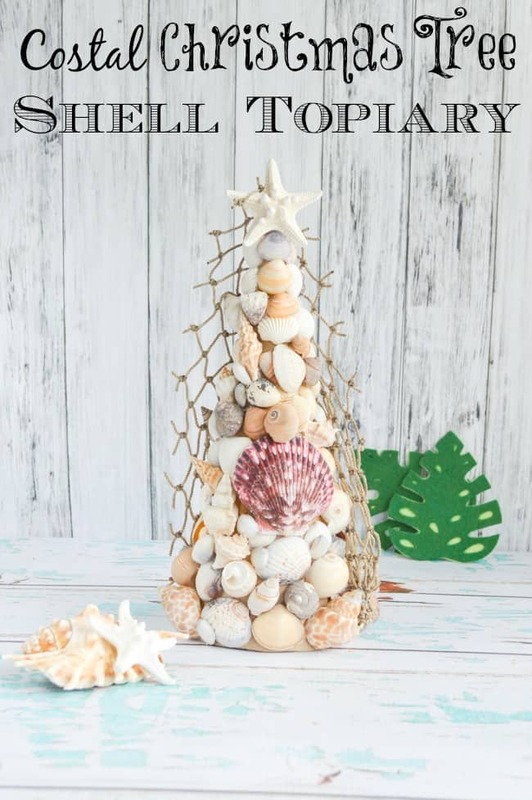 As everyone knows, I love nautical and beachy decor! 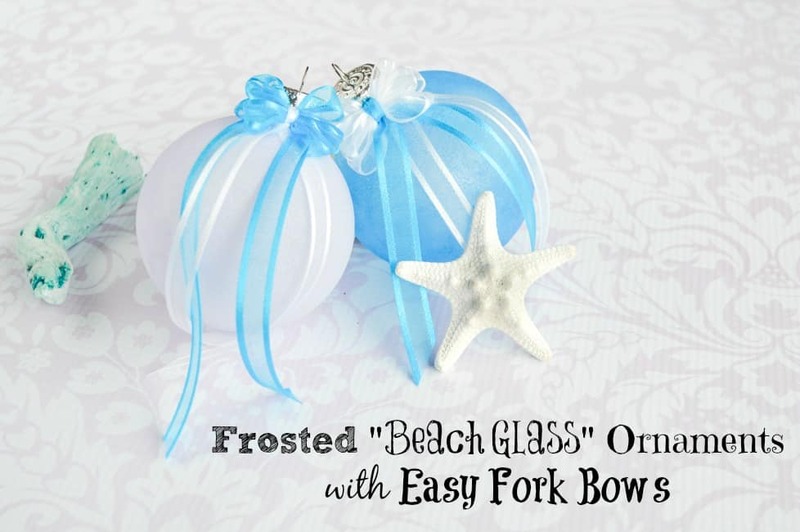 This tutorial shows you how to make frosted (looking) “beach glass” ornaments using those clear glass ball ornaments and then decorate them with cute little bows. My mom is a bow magician, but I didn’t inherit her amazing bow skills. I have to rely on tricks to make bows! 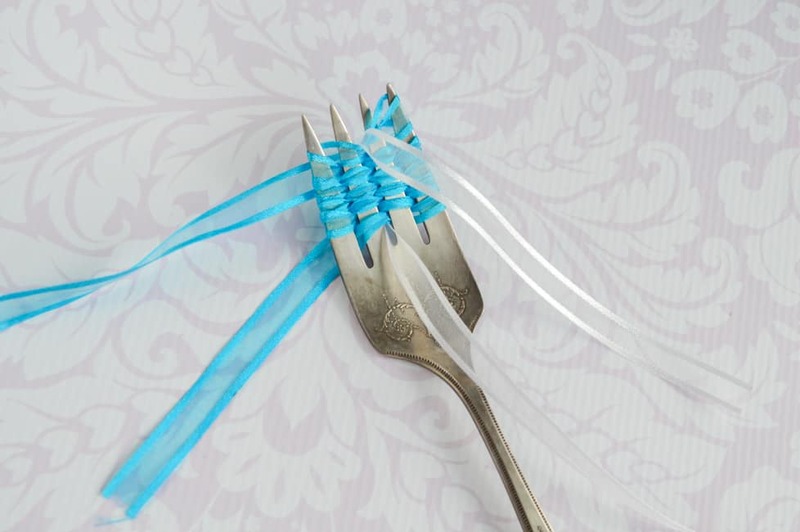 This tutorial shows you how to scale up the wonderful fork bow tying trick to make them on a serving fork and them attach them to your sea glass globes. Cool, huh? 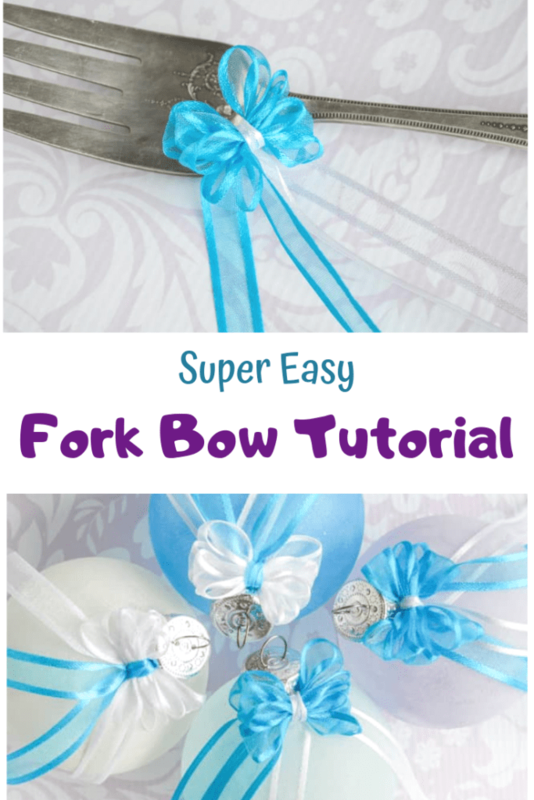 Who’s ready to make a super easy fork bow??! 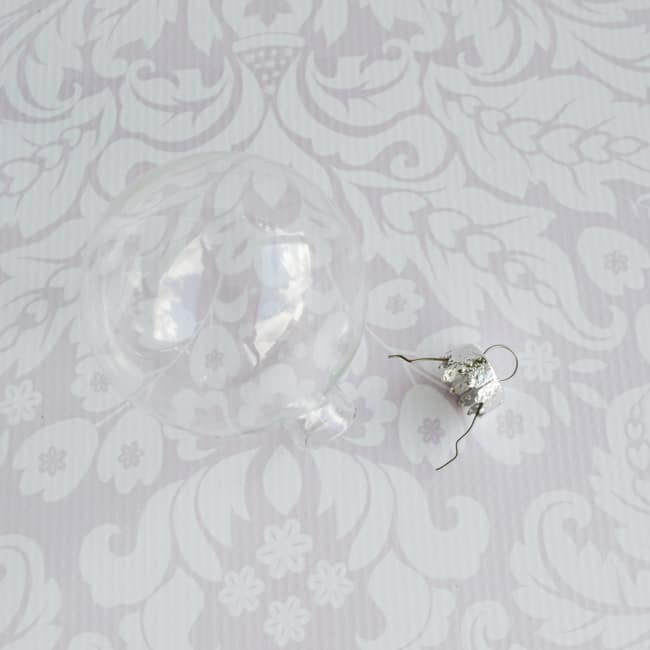 They’re seriously a lifesaver whenever you need a tiny, perfect bow, not just on these ornaments! 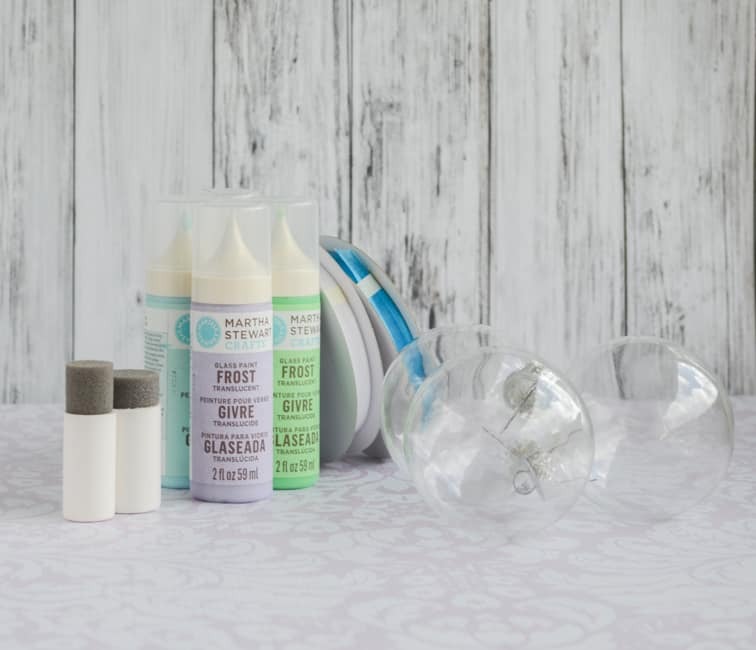 I used Martha Stewart Frost Glass Paints, but if you have a different brand of a similar product go ahead and use it. I’ve discovered that multiple thin coats work way better than one thick coat, so just pounce it on a little at a time and then add layers until you’re satisfied with the depth of color. 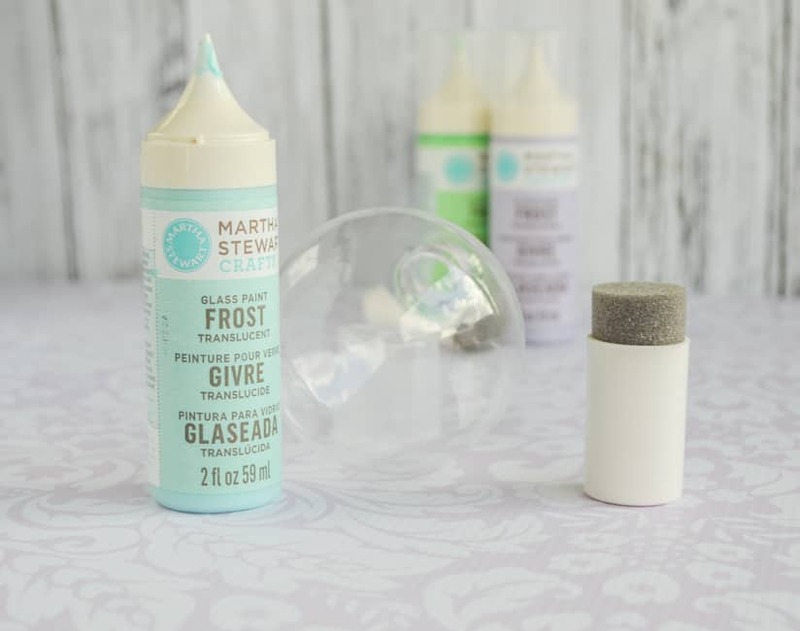 Edit: Unfortunately, it seems like the exact “frost” glass paints I used are not currently available, but there are different Martha Stewart beach glass translucent paints now. Hooray! For a while I couldn’t find either, so this is exciting news! 1. Carefully remove the metal tops from your ornaments and set them aside. 2. Pounce paint on your ornaments in light layers. Allow the paint to dry between coats and keep layering until you’re happy. I put three layers on most of my ornaments. 3. Once the ornaments are completely dry, put the metal tops back on. Be careful not to scratch the paint with the metal prongs. 4. Cut your bow ribbons. I like to cut about 2 feet of my primary color and 10 inches of my secondary color. 5. 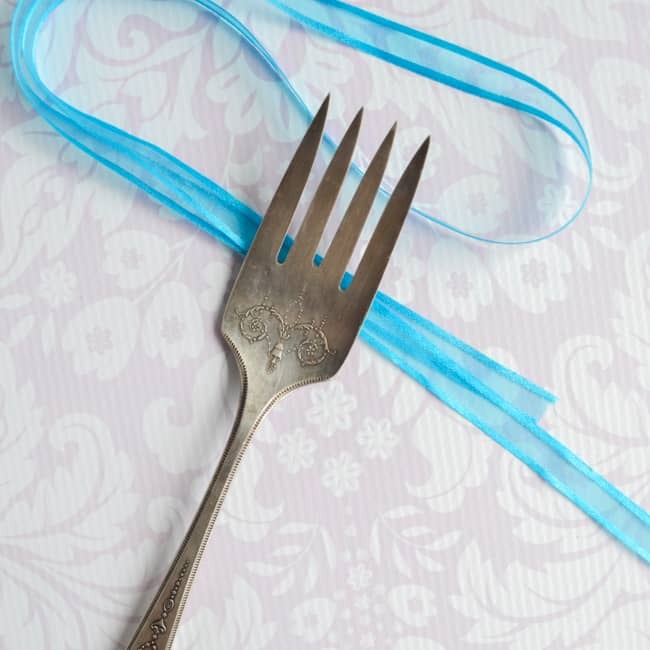 Leaving about a 6″ tail to the left of the fork, weave your ribbon through the fork’s tines. 6. 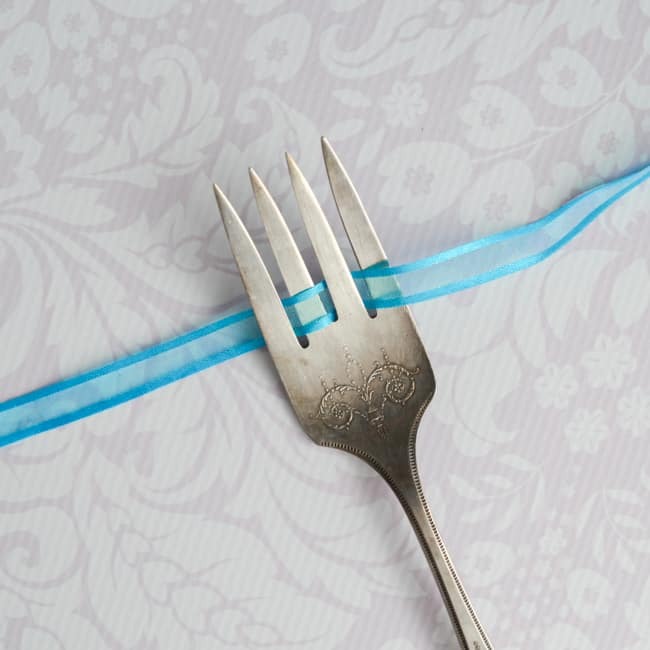 Continue looping the ribbon around the fork, as shown. I like to make 4 or 5 passes, but you can make however many you want/your fork allows. Each pass equates to one loop on the bow. Make sure your loose ends come out opposite sides (as shown below) or your finished bow will look funky! 7. When you’re satisfied with the number of loops you’ve made for your bow, scrunch the ribbon up towards the middle. I had to bring the right end of the ribbon back across to hold everything in place for photos, but don’t do this. Keep it sticking out to the right, like in the photo above. 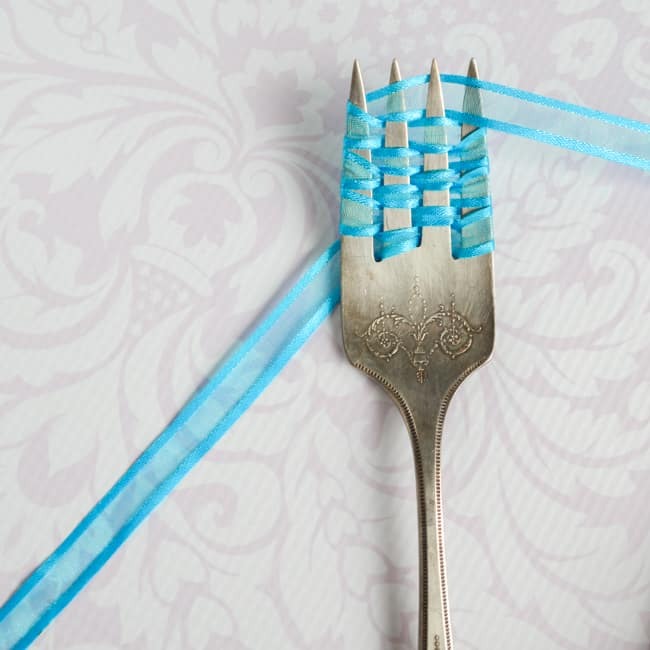 Pull your shorter piece of ribbon down through the hole in the bottom between the two middle tines and then back up over the top of all the ribbon loops. 8. Cinch the ribbon loops in and tie the shorter ribbon in a tight square knot. For an even tighter bow, make a single overhand knot (like you’re tying your shoes) while the bow is on the fork and then tighten it down more and add the second loop after removing the bow. 9. 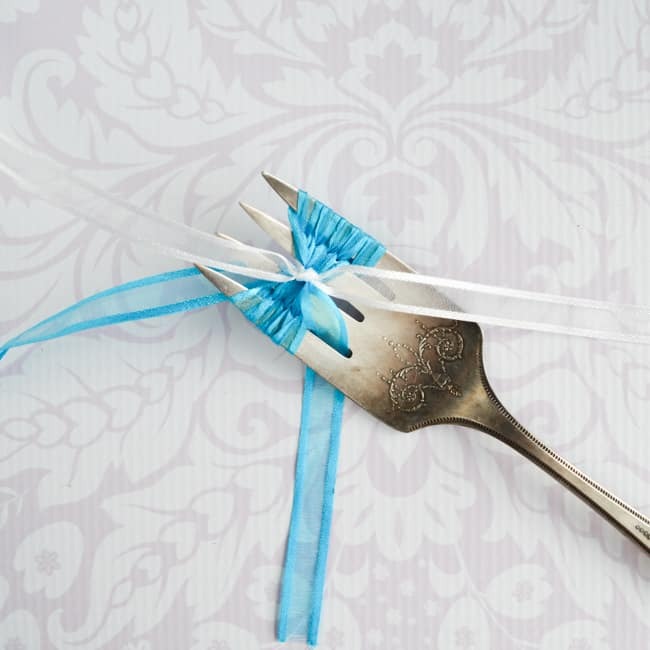 Slide the ribbons off the fork and fluff the loops, as needed. 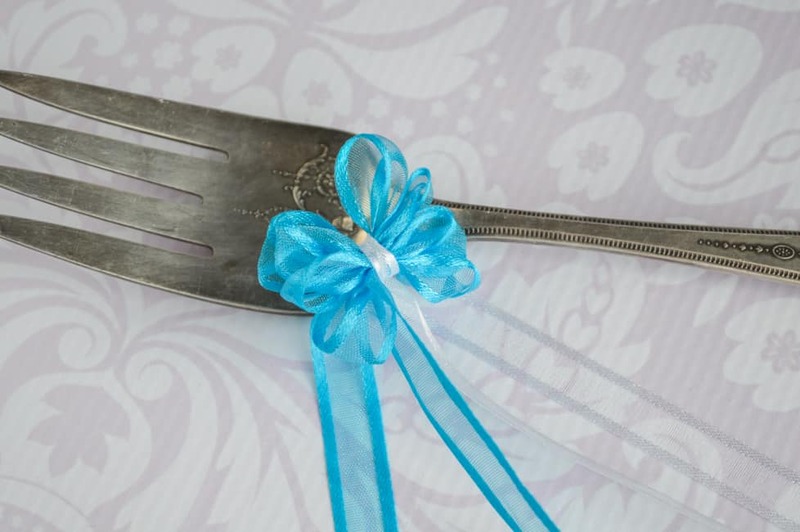 Voila – it’s a perfect, tiny bow! 10. 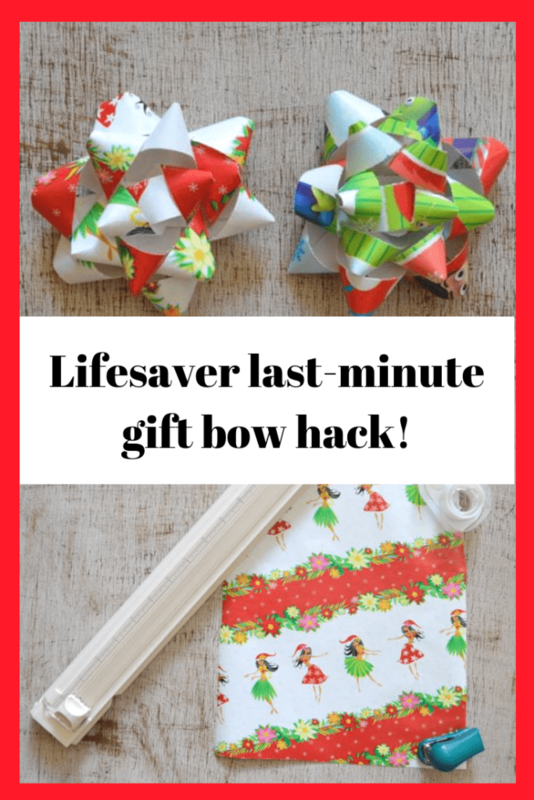 Make as many bows as you need. 10. 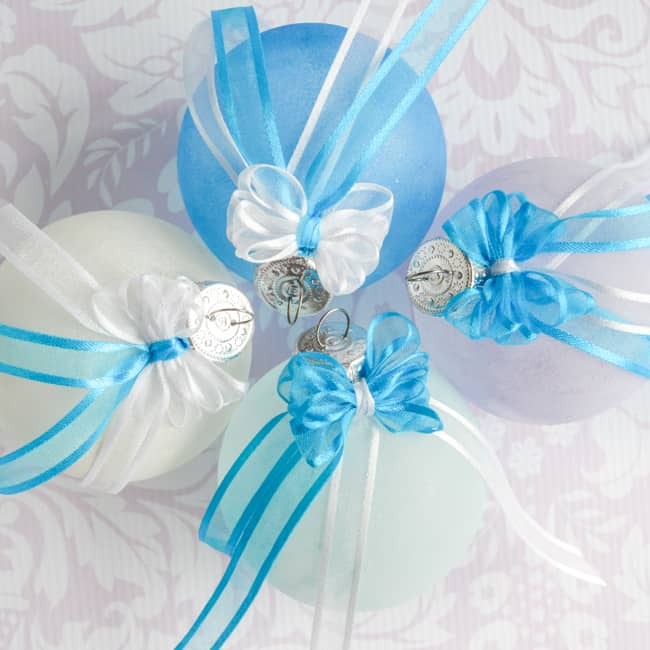 Using hot glue or your adhesive of choice, attach the bows to your ornaments. You can also tie them in place, if you’d prefer. 11. Trim the ribbons. I like to cut the ends at a slant for a more finished appearance. If you’er looking for more Christmas tutorials, you’ll like these posts! In addition to making ornaments, I’ve also been busy making presents for family members. I’d love to share details, but people on my Christmas list are known to read my blog! How many of y’all are giving homemade this year? 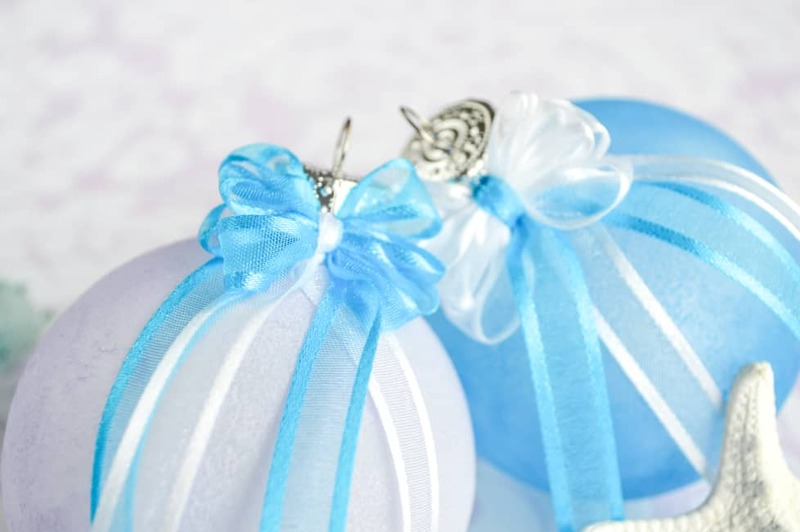 Love these ornament and the nifty bow-trick!